Time is racing away. I've never known it go by so fast - Edwaed de Bono once wrote about why it accelerates as you get older and I tend to agree with him. He said (or in similar words) "Imagine you are a young four year old boy and ask your mother for a toffee. She might say ' you can have one in ten minutes'. Now, as an eighty year old man, you ask for a toffee. But you are now twenty times older than the boy, so you will have to wait three hours and ten minutes for your toffee! In other words your conception of time passing is speeding up every day. Which is why I haven't written a blog for nearly three weeks (when I thought that just over a week had gone by). We made a five day vist to my young friend's home town to celebrate her birthday in the middle of July. 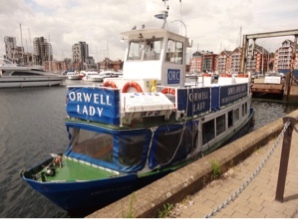 We stayed with her parents who had arranged for a boat trip on the actual day from Ipswitch to Pin Mill on the river Orwell. And what a nice trip it was. The weather was perfect. 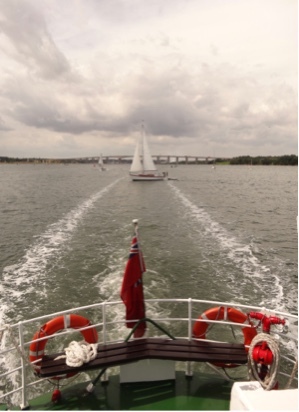 Here we have just gone under the Orwell bridge. 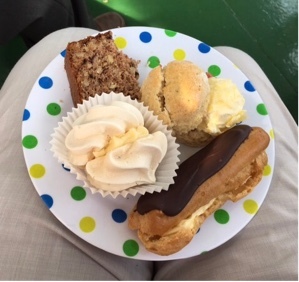 At about four o'clock we all went downstairs to a lower cabin where a home made cream tea was served. Myf and her parents really enjoyed the day - as did I. 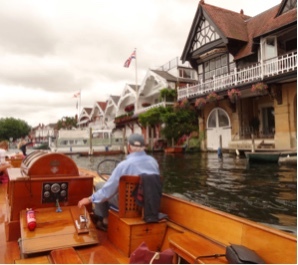 Back in Henley on Sunday afternoon I managed to spend a couple of hours at the Traditional Boat Festival. 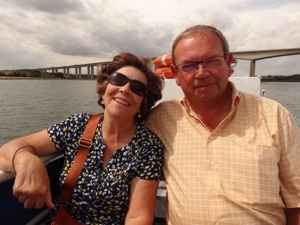 It was a swelteringly hot day so I was pleased to be invited by Tony and Jackie Hobbs to take a trip between the locks on Tony's boat 'Enchantress'. 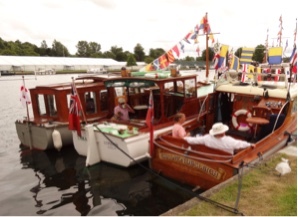 I always enjoy this festival - so many beautiful boats, lovingly kept in immaculate condition by their owners. 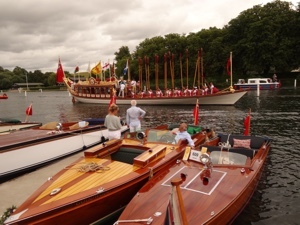 Here are some of them framing this view of the Queen's Royal Barge 'Gloriana' with oars raised in salute. 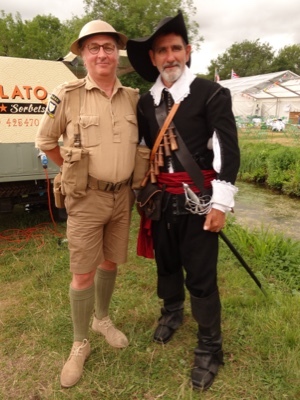 A couple of the more interesting characters wandering around the riverbank. 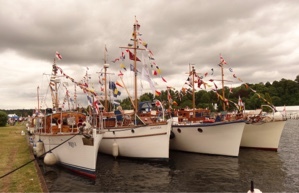 And then on to the Dunkirk Little Ships. All the more interesting after seeing the specracular film 'Dunkirk' the other day. 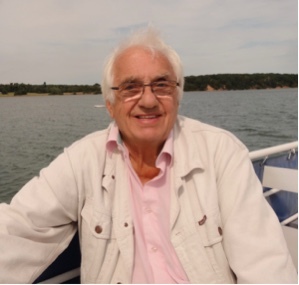 John and Sally Calvert own 'L'Orage' where I spent some time sipping nice refreshing elderflower wine. 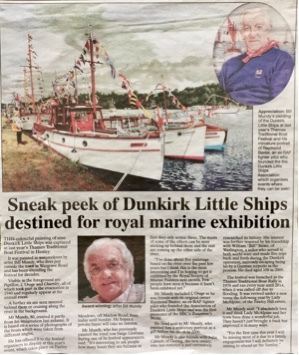 Incidentally, The Henley Standard - our local newspaper - wrote a very nice piece about my Dunkirk Little Ships watercolour painting which coincided with the festival. 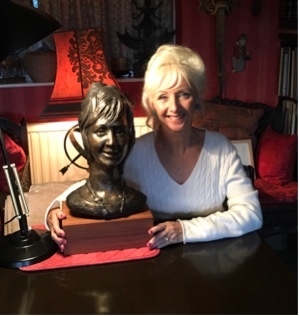 For the past few months I've been working on a sculpture head of Debbie McGee. 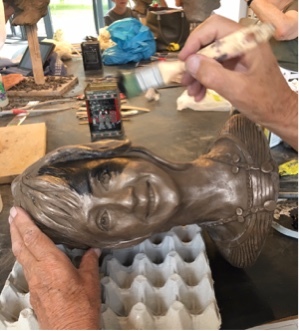 She and her sister Donna came to dinner, together with Val, on Sunday where I showed her the finished bronze head. It still needs more polishing to temove more of the blacking I covered it with. The first picture shows me starting to cover the head with grate blacking, and the second with Debbie. (Incidentally my young friend made the really delicious roast dinner we all enjoyed so much). 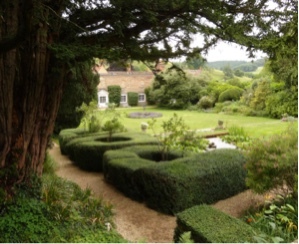 On Sunday we visited Stonor Park. 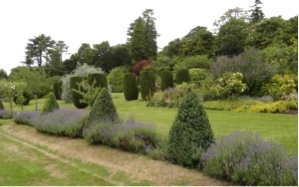 Set in rolling hillsides it has been the home of the Stonor family since 1150. Lord and Lady Camoys live there still. We toured the house after lunch in the quaint little teahouse. Pity photography isn't allowed inside the house as it contains many beautiful portraits, apart from well-appointed rooms. We've visited many country houses but those that are still lived in by the owners are always more comfotable looking. Later we strolled around the gardens. So well tended. I loved the topiary. 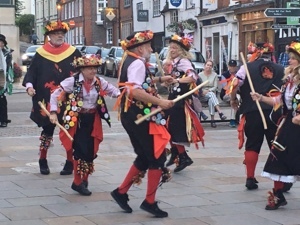 The other evening, as we were returning to our car from dinner at The Catherine Wheel in Henley, we noticed more than the usual activity in Falaise Square. 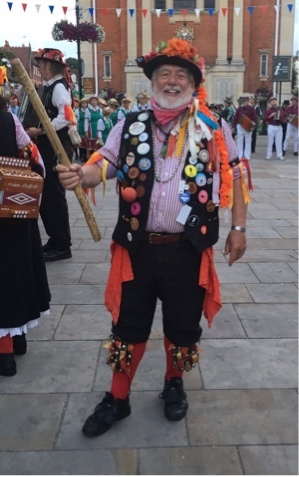 There we found a gathering of many Morris Dancers. They were holding a festival of some sort and at least six different teams were there together with a number of musicians, singers and fiddle players. I may paint a miniature of this colouful character. I bought new varifocal spectacles the other week but can't really get used to them. 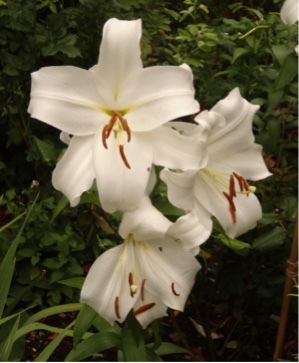 Having worn varifocals for many years I found this pair gave me ghost images - especially when looking long distances. So after several sessions at my opticians it seems that a cararact That has been safely marooned right at the back of my (good) eye has moved in the last three months. So to correct this problem it was suggested that, in the not too distant future, I should consider an operation on my eye in an attempt to correct my vision. My close-up vision is good with no discernable ghosting, so painting miniatures and other detail work is not affected but I do worry that after the cataract operation my miniature portrait painting days may be numbered. As it happens, for the past few months all my commissions have either been pencil portraits or large oil portraits. I'm also in the last stages of my Dunster Yarn Market oil painting - wich I'll show you on my next blog. I have few ambitions left but one of them is to fly in a real World War Two Spitfire. This is possible and I aim to fly from Biggin Hill sometime next year. 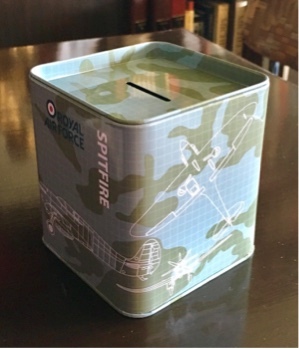 So I've bought a 'Spitfire money box' and aim to find the money (£2,500) by saving all lottery and premium bond wins. plus 5% of any future commissions to pay for the trip. I mentioned this ambition to my friend Norika the other week and it was she who suggested saving up for the experience and donated the first £5. This is the money box.